I've been a little light on the outfit posts, because I'm gearing up for FFFWeek. I figured this would be a good time to do a multi-look post using one skirt. I'm always remixing outfits by mixing in old pieces with new ones. As a stylist, I think one of the biggest things I see is the reluctance to mix pieces. A lot of people buy an outfit, meaning they matched a top and bottom in the store, and will forever wear just those two pieces together like they are married for life. Well, in this case, divorce is good thing. Remixing is also budget friendly, because instead of buying a whole new look, you may just have to buy a top, bottom, or just a jazzy pair of shoes. Style note: Pink Clutch found here. Gold mini suit case gifted from my nephew and was apart of a Estee Lauder makeup gift set given to me years ago. Hi-Lo top is from Asos, I purchased it last year. Also, the skirt and necklace are new, everything else I already had. Find the pieces (or similar) below, just click on the item you are looking for. Similar skirt found here, similar top here. Great post!! I love the hi low top and always wondered how it looked on. and the best part about that is that I don't care! Horizontal stripes look great on all bodies, take it from me. I love the skirt and now I wish I had snapped up that Asos hi/lo top last year; it looks great on you. you look fabulous darling...just ordered me on from Vince Camuto can't wait to see mines grow and look gorgeous! Looking fabulous as always! I just have to ask, where do you find plus size crop tops? Thanks! This one is actually straigt size from Asos..I provided the link. Other I have bought were from JIBRI and http://iamkhatu.blogspot.com/ -- both of them are etsy designers. I have a skirt like this. This is giving me inspiration! You are gorgeous! Love the way you've styled this differently for each occasion. Perfection! I love each look, they are all so lovely work it! Love the stripes and they look great on you! Just bought an orange horizontal striped skirt that I can't wait to wear on vacay! I love all these looks. Thankfully, I have a skirt that's very similar so I can try to recreate them. OMG! OMG!!! You did that. I love it Chastity and I'm so inspired!!!! was the crop top you purchased the aso curve sizes? No. I purchased the size 14 in the reg. sizes. I have a blue and white stripe pencil skirt, and you have given me some great inspiration to break it out this weekend! I think I will pair it with a dip-hem tee - I love your coral one! 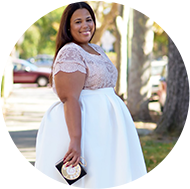 Enter my Plus Size Maxi Dress Giveaway! love the combos in the one! they go great to the theme! i need a crop top like you!!! Love the different outfits you can pair with a single striped skirt! Classic piece! I love the pink shirt and extra large clutch contrast in the day look. Love all three looks honey! Gorgeous!! The second and last looks are my favorite but I like them all! Way to go at showing how versatile stripes are. The hi-low top is my favorite pairing. That peach color looks great on you. I love all three looks!!!! Can't find a horizontal striped skirt anywhere that looks like that! :-( I've looked since last year. All I found were the skinny stripes! You look amazing in everything you wear!!! Thanks for the fashion blogs!! !